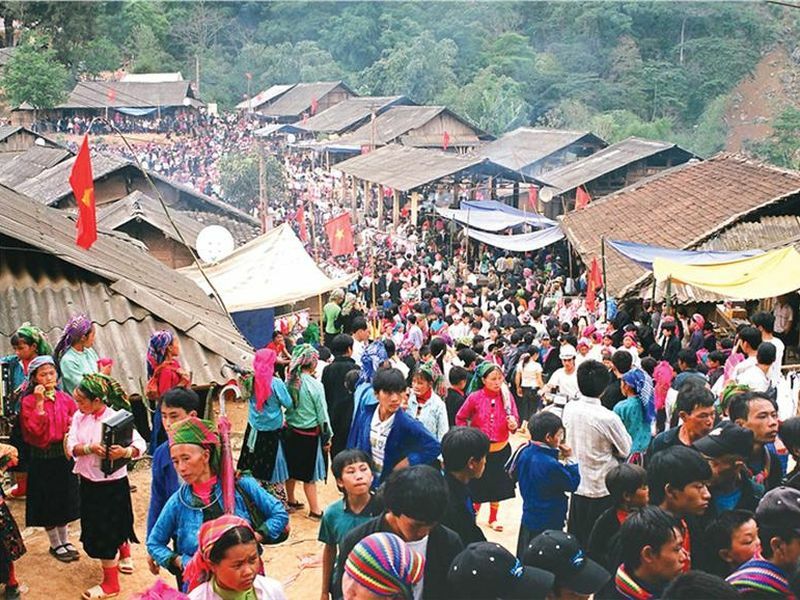 Khau Vai market, also known as Phong Luu market, Khau Vai love market, is located in the Khau Vai commune, Meo Vac district, Ha Giang city, and took place only once a year on the March 27 according to the lunar calendar. It is one of the most attractions when travelling in Ha Giang. At first, the market has no seller but because this is the place for people to find each other, after a year (can also be several years) apart, mainly those with rough love affair, really love each other, but for some reason, they can not be married to other, and now every person has own family. Right on this day, they meet each other to talk and review their old feelings. There are a lot of married couples go to the market together, the wife finds her friend, and so does husband, they are not jealous, not frustrating, but respect each other, also their friend. They join the Khau Vai love market and then back to their daily life and continue to live happily together. Khau Vai love market is unique in Vietnam, even more unique and rare all around the world. From March 26 (according to the lunar calendar), people in their ethnic costumes go down the market, who in remote villages then go from earlier. Even rugged mountains, deep streams and dangerous road, they are excited, they pant ... because tonight will be a night of romantic love, every year only once. All together towards the love market, towards someone he (or she) had loved, is loving also will love... as towards the most significant and sacred ritual. When the sun goes down, the mist spreads to the sky, the large fire was burning up, the big wine cans are brought out, then Khau Vai love night begins. Early morning of 27th is the time that love market has the most meaningful. The wine has run out, the market comes to an end, now the parting time has come. At the roadside, along with the slopes, cliffs ... the two were loath to part with each other, they promise to meet again in the next year. The yesterday story and today life there is something truth and fiction, have created more exotic and also enticing to this land. Perhaps it is the connection from the past to the present and the future, the spread of the legendary romance on Dong Van Plateau, and somewhere halfway up the mountain, sometimes we hear the sentiment invitations. Today, Khau Vai love market has changed a little but still remains its own unique. In an atmosphere of joyful excitement, we still catch the eyes that are searching, still hear the whisper of the wind in the air, still see the warmth moments, the happiness of the couple meet again after the date of separation. There is a profound culture of the love market, the human values in the spiritual life of the people here. 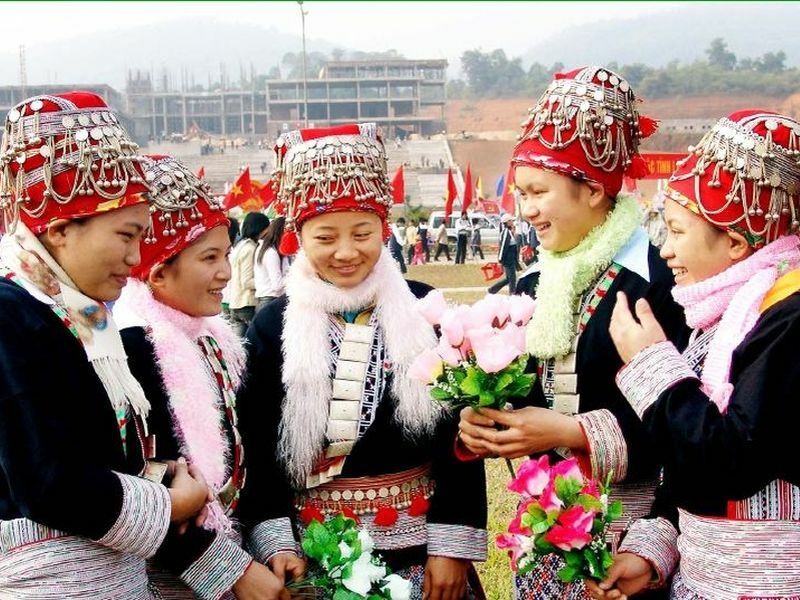 Now, Khau Vai love market in Ha Giang is not only the place for boys and girls love each other but can not get together, has become a space for love dating, for the souls are searching for happiness.